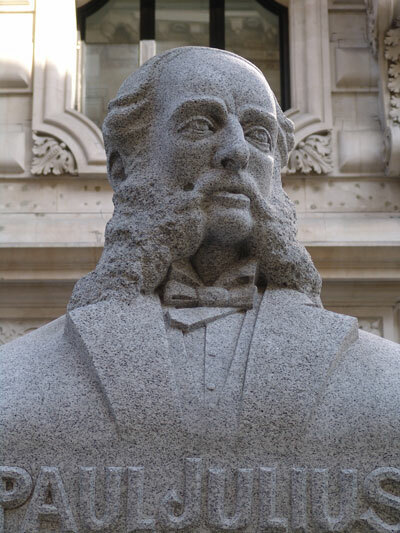 Under contract to the City of London, we regularly maintain over 80 public sculptures, fountains and plaques, including this memorial sculpture in Royal Exchange Buildings. 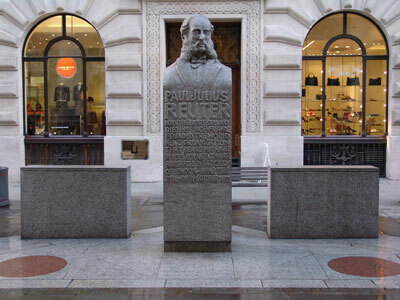 The subject, Paul Julius Baron von Reuter (1816-1899) was a Jewish-German-born British journalist and media owner, the founder of Reuters news agency. The sculptor, Michael Black, is known for having restored the Roman Emperors' heads on the Sheldonian in Oxford (1970-72) and has two works in the National Portrait Gallery. In 1984/5 he carved the niche figures of Crutched Friars for the Commercial Union Insurance Office in the City of London. He lives and works in Oxford.